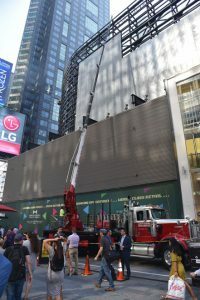 With the recent installation of a 9,200-square-foot LED digital display for McDonald’s® on the iconic BowTie Building at 1530 Broadway in New York City, North Shore Neon Sign Company can now lay claim to the five largest screens in Times Square. The McDonald’s display comes in as the third largest. 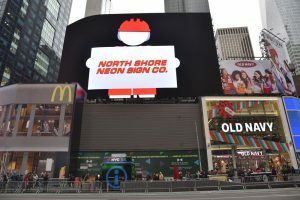 “It’s just a continuation of us being able to do the biggest projects that New York can throw at us,” says Patrick Dooley, vice president of North Shore Neon Sign Company. North Shore has been working in the metro New York area for over sixty years. The full-service, third generation family-owned sign company has done everything from signage for car dealerships, retail outlets, and banks to the mega LED displays of the signage spectaculars in Times Square. In fact, you may remember our story about North Shore’s work on the Marriott Marquis display (“A Signage Spectacular,” February 2015). McDonald’s is no stranger to North Shore’s work as the two companies have a professional relationship that spans twenty years. In that time, North Shore has installed signs for a variety of McDonald’s locations in the New York metro area as well as manufactured and installed custom signage and storefront façades for the restaurants. 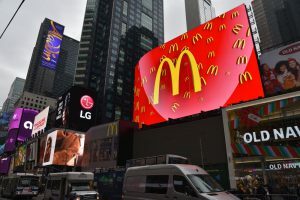 Drawing on those two decades of experience—and thanks to the facilitation of North Shore Vice President Michael Colamussi, who has worked with McDonald’s over the last twenty years—McDonald’s tasked North Shore with upgrading the billboard on its new Times Square restaurant to digital. Having engineered and built the original 100-ton sign structure in 2016, North Shore was very familiar with the site. 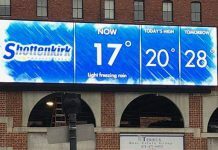 “We were contracted by the building to remove and replace the traditional ‘stick built’ static billboard as part of a complete building upgrade,” says Dooley. “We convinced the team that it would be in their best long-term interest to build the structure to one day be able to structurally receive an LED display. We had no idea that it would only need to wait two-and-a-half years to see that happen. In order to get the existing structure ready for the LED display, North Shore completed a technical survey to ensure new vertical steel that was installed would be plumb and level. “We were working from the existing primary structure that was in place for the sign, and then we needed to take those still existing dimensions and create a sign to fit around them,” explains Dooley. 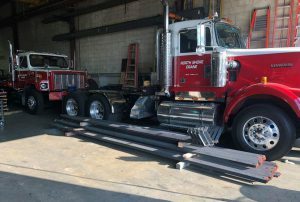 North Shore’s steel shop created shop drawings and fabricated all of the vertical steel added to the existing structure. North Shore tapped Daktronics for the digital display, and the company was able to deliver the electronics on time so that the sign company could stay on a very compressed schedule. 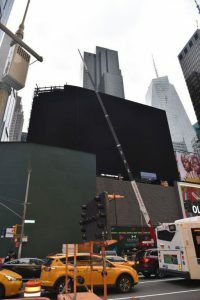 Since the billboard was located in busy Times Square, North Shore had to complete a vast majority of the installation—including delivery and installation of the steel—afterhours. North Shore’s SMART Sheet Metal Workers Local Union 137 handled the installation of all of the vertical steel as well as the digital display. North Shore used a variety of cranes, which it owns, on the project, including a Skyhook 130 EXHD, 45-ton Demag AC-40, 36-ton National Crane, JLG 1850SJ Ultra Series Telescopic Boom Lift, and JLG 1350SJP Ultra Series Telescopic Boom Lift. North Shore also had to contend with the yearly crane embargo. The embargo runs from about a week before Thanksgiving through the New Year and prohibits the operation of heavy equipment like cranes in areas of New York City that become heavily populated during the holiday season. 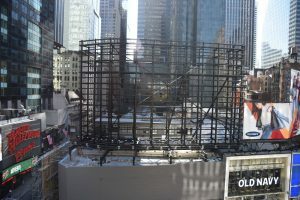 When they couldn’t use large cranes, North Shore instead employed a variety of installation techniques ranging from mobile cranes and man-lifts set up on the Times Square Plaza to hanging scaffolds with a winch installed on a davit attached to the sign structure. A significant portion of the work was the primary electrical feed. Using their electrical license, North Shore’s Local Union No. 3 IBEW electricians installed 300 feet of large diameter four-inch conduit and pulled the primary electrical feed of 1200A from the basement to the roof of 1530 Broadway. According to Larry Brown, lead electrician at North Shore, they installed electrical panels distributing the service to the individual LED cabinets. Additionally North Shore provided a rooftop-mounted control room, which was comprised of steel dunnage, an HVAC system, and sufficient electric to power the content management system driving the display. All in all, the McDonald’s display was completed on schedule, within budget, and with all parties’ expectations met. What makes this feat even more impressive is that North Shore completed the project without a general contractor. To keep the project on track, North Shore held almost daily meetings and fell back on its employees’ experience. In fact, the LED display was so impressive that the McDonald’s marketing team went back to create new and dynamic content that would match with the capabilities of the display and provide unique experiences to guests dining at the restaurant. “They were looking at the board more as an adjunct of the restaurant that they were building below,” says Dooley. “[They didn’t fully realize] the capability of the display and what it could provide to them from an exposure standpoint as well as from an advertising standpoint. And as the process started moving along, I think they started to catch on to what they were actually getting. One thing’s for sure—the new LED display will be driving in traffic to McDonald’s for years to come. All photos: North Shore Neon Sign Company.